Harper said this is his way of sharing Christ. He oversees Sleep In Heavenly Peace, a non-profit that partners with organizations, churches and businesses to hold Build Days during which beds are built from scratch to last a lifetime. No woodworking experience is needed. At one build, he said he had a 10 year old up to a 70 year old. Volunteers are supervised and tools are supplied on Build Day. Employees or organizations network and build relationships while doing volunteer work, Harper said. The beds are delivered assembled to an appreciative home, complete with a mattress, bedding and pillow. “Kids will be ready to be tucked in,” Harper said. Some of the deliveries have come with bibles provided by Lifeway. Volunteers may go on the deliveries. Recently, seven ladies delivered to five sisters–twins at age 4 and their 5, 6 and 7-year old siblings. Qualifications include sleeping in one bed with parents or siblings, on the floor, or on a couch, futon or between two chairs. Applicants may apply online at www.SHPbeds.org. The cost to build a bed is $175. The organization or business must provide the amount for a minimum of 10 beds to participate. One hundred percent of donations go toward Sleep in Heavenly Peace. Lowe’s provides a discount on building costs and Johnson’s Furniture has trimmed prices for mattresses. Pastor Nicholas Onyach allowed for Mary, Queen of Peace Catholic Church’s Ash Wednesday and March 10 collections to go to the project. More than $1,200 was donated, enough for seven beds. 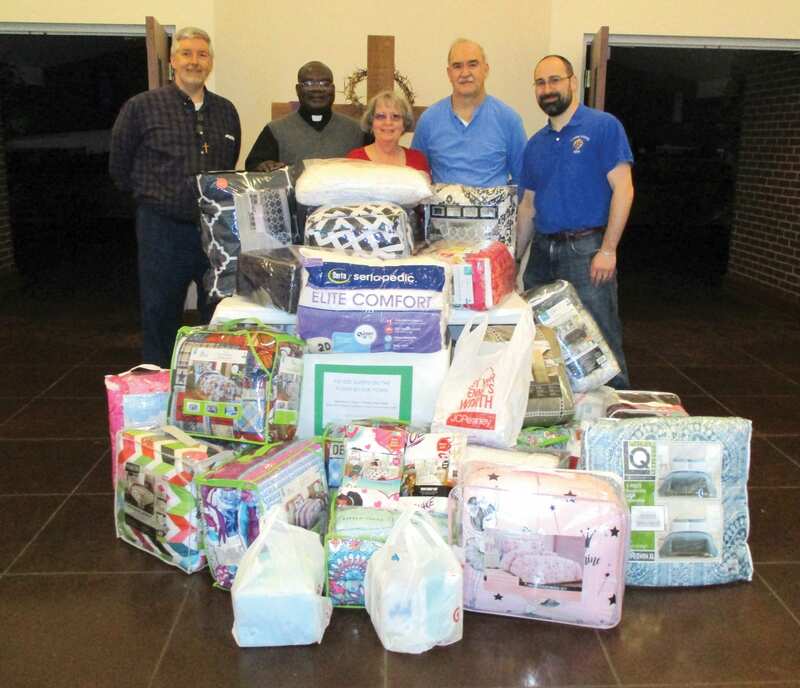 Mary, Queen of Peace also collected more than 20 sets of new sheets. Future builds are at Citizens National Bank on Highway 80 on Good Friday and First United Methodist Church in Bossier City. Harper was watching Mike Rowe’s “Returning the Favor” when it featured Sleep in Heavenly Peace a year ago when his “eyes starting leaking a little bit” and his wife walked into the room and he told her he wanted to do this project. Enough money was raised for him to get training to begin. “Returning the Favor” is an American reality web television series. Rowe travels across the United States in search of people who are giving back to their communities. At the end of each episode, those being profiled get surprised with a reveal that allows them to do even more of whatever kind of good work they are doing. In a year, Harper said 52 beds have been made and 38 delivered due to waiting on mattresses and linens for the other 14. There are 130 people on a waiting list. Forty beds are to be delivered this week and a build is being held every two weeks until June 15. Harper is also known as the voice of Parkway High School football games. He is now using that voice in additional ways. For more information on how to contribute, volunteer or apply for a bed, call 658-2765.